Last week, I presented Jenn with two alternative designs for her master bedroom. 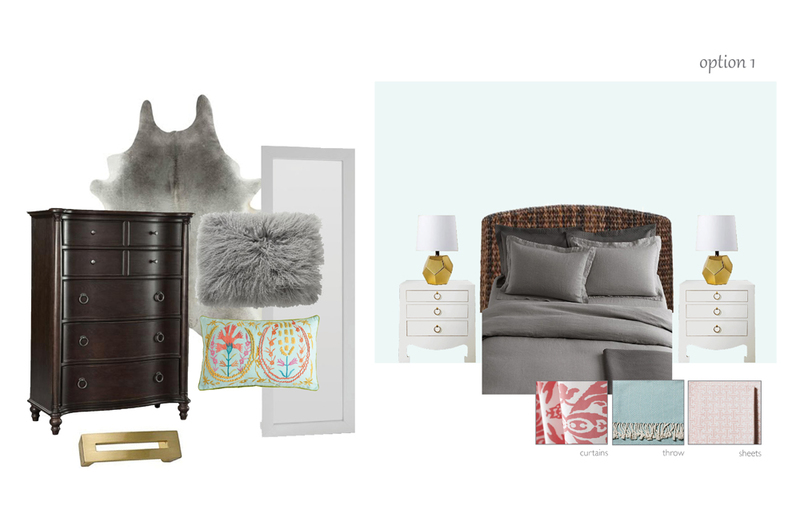 The color mint provided the new inspiration while I selected to keep the items that they really liked from the first proposal - bedding, lamps and nightstands. In option 1, Jenn's dresser would be refinished in a dark stain and we would use a wicker headboard to tie in the rich wood tone. I would pair this with more subtle notes of coral in the sheets and accent pillows but would introduce a bolder pattern in the curtains. In option 2, I went for a more tone on tone look using a color palette of blues and teals. The overall feel would be more masculine and modern. In this design, the dresser would be lacquered navy and we would use a light gray headboard. Jenn liked the options but she also found herself gravitating back towards the coral schemes. I told her to take the week and think about what she was intuitively drawn towards and we would talk when I got back. See below!